Syrian government forces backed by Russian air strikes have launched a fresh offensive against rebels south of the country's second city, Aleppo. A military source told Reuters news agency that "hundreds" of troops from Hezbollah and Iran were also involved. Control of Aleppo has been divided between government forces and various rebel groups since 2012. The Syrian army has launched at least four ground offensives since Russia began air strikes two weeks ago. They are in a wide stretch of mostly rural territory north of the cities of Homs and Hama, in the rugged northern parts of Latakia province along the coast and now the villages and countryside south of Aleppo. In a statement the Syrian army said that it had inflicted "heavy losses" on rebel groups, with the help of Russian strikes. 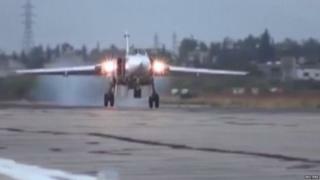 Russia says it is targeting "terrorists", primarily jihadist militants from Islamic State (IS), but Western governments say many strikes have hit civilians and moderate rebel groups. Despite the intervention of its Russian and Iranian allies, the Syrian regime is unlikely to be able to sustain major offensives on several fronts at the same time, the BBC's Jim Muir reports from Beirut. It is more likely that the multiple attacks are aimed at keeping the rebels under pressure and off balance, while Russia drops bombs and the Syrian army inches slowly forward, our correspondent says. In a separate incident, Turkey said it had shot down a drone that intruded into its airspace near the border with Syria. BBC Defence correspondent Jonathan Marcus says the aircraft in question seemed to be similar to military drones of Russian origin. A US official said they believed the drone was of Russian origin, but Russia says that all their drones have been accounted for and that non had violated Turkish airspace. Earlier this month Turkey accused Russian jets - which have recently joined the air battle against Syrian rebel group - of entering its airspace. The Iran-backed Lebanese group Hezbollah said the Syrian army was carrying out a "broad military operation" across a 10-mile (16km) front south of Aleppo. "This is the promised battle," a Syrian military source told Reuters news agency. "The main core is the Syrian army", the source said, but added that hundreds of fighters from Iran and Hezbollah were taking part. There are unconfirmed reports that hundreds of Iranian troops have arrived in Syria to join assaults on rebel positions in northern and central Syria by government forces and fighters from the Lebanese Shia Islamist movement, Hezbollah. An unnamed US official told AFP that as many as 2,000 Iranian-backed fighters were helping the Syrian army near Aleppo. "We are now seeing a coordinated effort between Iran and Russia to assist Assad with fighting opposition groups", the official said. Iran, a staunch ally of President Bashar al-Assad, has long acknowledged sending military advisers to Syria, but has denied the presence of any ground forces. Several high-profile Iranian advisers have been killed in the past month as the fighting continues.